BMW has just released some new information on the new 7 Series Facelift and its hybrid models. The press release pertains to the European market and covers the 745e, 745Le and 745Le xDrive. The new plug-in hybrid system now includes an in-line 6-cylinder petrol engine that has been adapted on a model-specific basis to produce a peak output of 210 kW/286 hp. An electric motor with a rated output of 83 kW/113 hp and a rated torque of 265 Nm is paired with the combustion engine. When the driving experience switch is set to SPORT mode, an overall system output of 290 kW/394 hp is available and a maximum system torque of 600 Nm. The new BMW 745e accelerates in 5.2 seconds from zero to 100 km/h, while the new BMW 745Le takes 5.3 seconds. 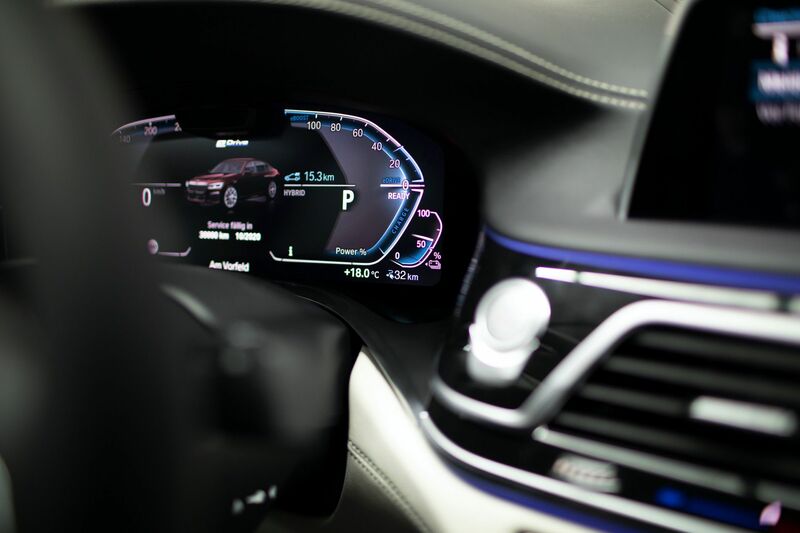 Meanwhile the new BMW 745Le xDrive reaches the 100 km/h mark from standing in 5.1 seconds. The maximum speed for all three models is electronically cut off at 250 km/h. The new high-voltage battery for the plug-in hybrid models of the BMW 7 Series now has a gross energy content that has been increased to 12.0 kWh. 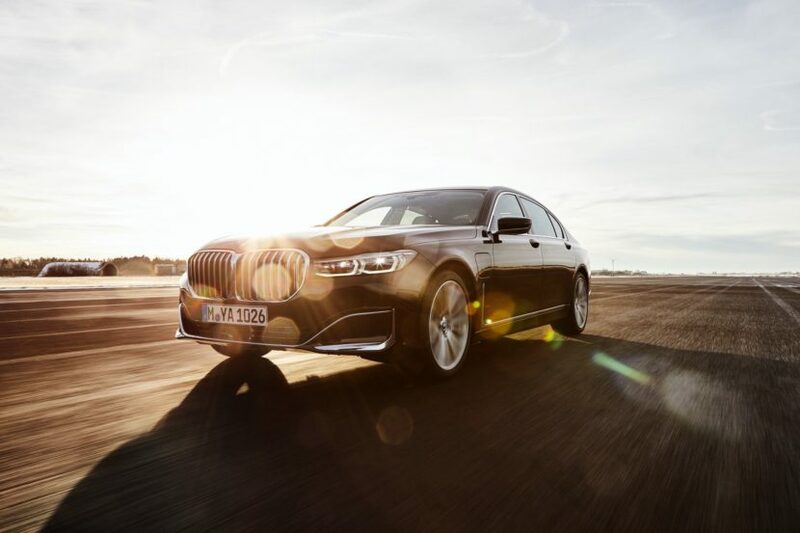 In HYBRID mode, the new BMW 745e, the new BMW 745Le and the new BMW 745Le xDrive can travel at a speed of up to 110 km/h – 20 km/h faster than the predecessor models – in purely electric mode. In ELECTRIC mode, the power of the electric motor alone is even sufficient to reach a speed of 140 km/h. The electrically powered range of the new BMW 745e is between 54 and 58 kilometers, while the new BMW 745Le reaches 52 to 55 kilometers. 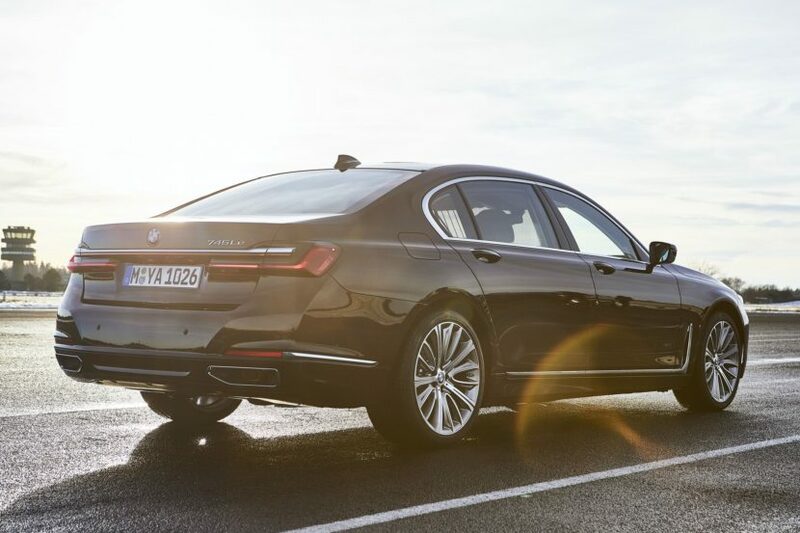 The new BMW 745Le xDrive achieves an electrically powered range of 50 to 54 kilometres. The EPA electric range for the US market is not available at this time. For the new BMW 745e, a combined fuel consumption was measured of 2.3 to 2.1 liters per 100 kilometers, a combined power consumption of 15.6 to 15.1 kWh/100 kilometers and CO2 emissions of 52 to 48 grams per kilometer. The corresponding figures for the new BMW 745Le are 2.3 to 2.2 liters per 100 kilometers, 15.7 to 15.6 kWh per 100 kilometers and 53 to 50 grams pro kilometer. 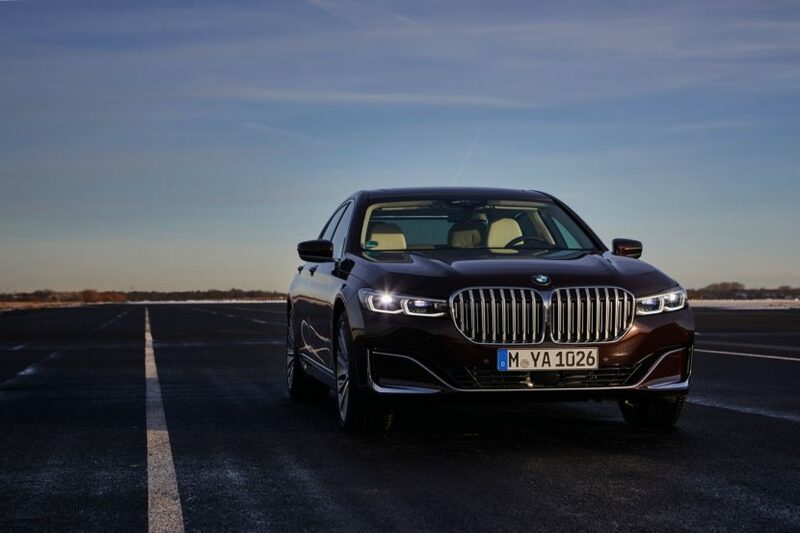 The new BMW 745Le xDrive reaches a level of 2.6 to 2.3 liters per 100 kilometers, 16.3 to 15.8 kWh per 100 kilometers and 59 to 52 grams per kilometer. The electric motor of the plug-in hybrid models is integrated in the 8-speed Steptronic transmission. The high-voltage battery is positioned underneath the rear seats, while the 46-liter fuel tank is located above the rear axle. This means that the luggage compartment volume of the plug-in hybrid models is only slightly restricted. 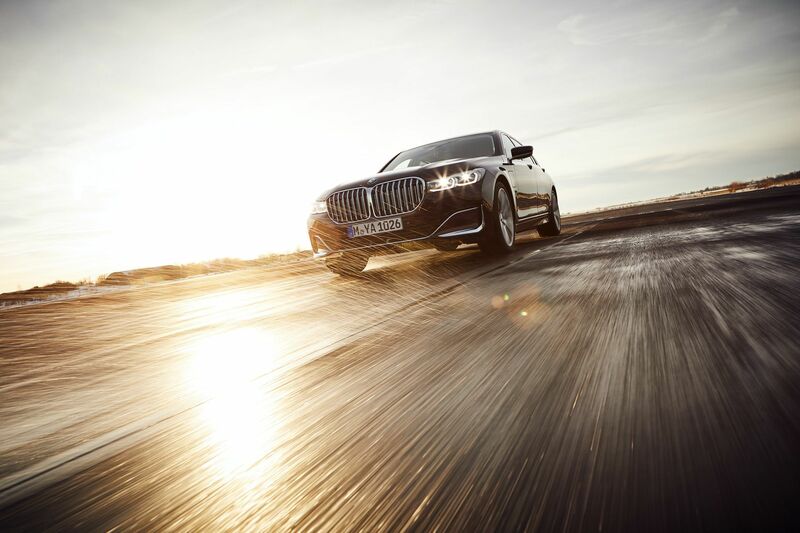 All the 7 Series hybrids are equipped with three driving modes – HYBRID, ELECTRIC and BATTERY CONTROL. For the European models, the exterior design Pure Excellence and the M sports package are available as options for new BMW 745e, the new BMW 745Le and the new BMW 745Le xDrive. As of summer 2019, new digital services will be available for the plug-in hybrid models of the BMW 7 Series which make charging the high-voltage battery en route even more attractive and convenient. When selecting a public charging station, the navigation system also provides the driver with a list of recommended nearby hotels, restaurants, cafés, tourist attractions and cultural institutions. In addition the customer is provided with a charging station occupancy forecast. BMW also enables ChargeNow customers to reserve a suitable charging station for a limited amount of time directly from their car. The U.S. is the largest global market for the 7 Series PHEV sedan which will go on sale in April 2019.